On this day in 1964, President Lyndon Johnson declared an "unconditional war on poverty" in his first State of the Union address. 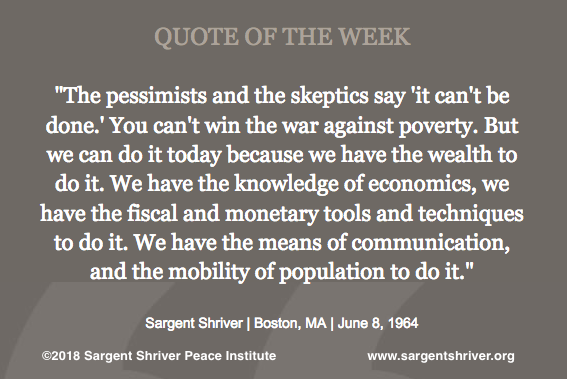 In this week's quote, Sargent Shriver brings us a very important message from that era, which is that the United States has the means to tackle poverty. Although Sarge spoke these words 54 years ago, they are perhaps more true today. We certainly have the resources to alleviate poverty in this country; the question is, do we have the will? Some background about Sarge and the War on Poverty: following the State of the Union, President Johnson called on Sargent Shriver, who was Director of the Peace Corps at the time, to lead the anti-poverty efforts. Sarge took up Johnson's challenge. He focused on the notion that people could lift themselves out of poverty if they were given the chance to do so. Heading up the newly-created Office of Economic Opportunity, Sarge led the creation of multiple programs that addressed the root causes of poverty: lack of employment, education, legal resources, health care, community support, and more. The poverty programs, Head Start, Job Corps, VISTA, Community Action Program, Legal Services to the Poor, and Foster Grandparents, were meant to be implemented and customized at the local level, so that individual communities could have the resources that would best help their most vulnerable citizens. And the programs worked: although funding and focus on the War on Poverty lagged as the war in Vietnam intensified, the programs have empowered communities for the past 54 years, many of them operating continuously to this day. This week's quote is from the Boston College Commencement, an address from the early days of the War on Poverty. In it, we see Sarge's combination of optimism, persuasiveness, and pragmatism, all qualities that he brought to the challenge that President Johnson issued 54 years ago today. Creating "an America Free of Racism, Hunger, and Despair"